Throughout January, artwork by Chuck Close and Kehinde Wiley will travel New York City atop 500 taxi cabs, thanks to art enthusiast and ShowMedia president John Amato. With an estimated value of $100,000, Amato said, “I can do this as my annual holiday gift not just to myself, but to everyone who enjoys seeing the art as it travels around New York City’s streets.” ‘Art Adds’ is the second annual collaboration between ShowMedia and the Art Production Fund, a campaign bringing art to the streets for all to enjoy. The inaugural year featured Alex Katz, Shirin Neshat, and Yoko Ono. Though some critics are skeptical of the seemingly too-good-to-be-true advertising ploy—or lack thereof—Art Production Fund co-founder Doreen Remen states, “This is nothing against consumerism or companies, but this is a different kind of exchange. It’s about the intangible and having a conversation that isn’t about the physical world,” according to the Wall Street Journal. 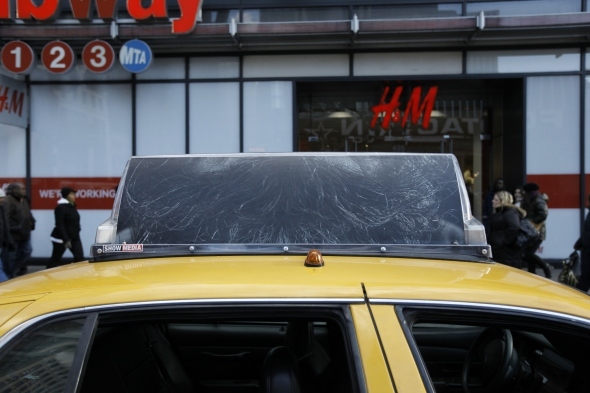 As both artists are known for their large works, the relatively small advertisement space of a taxi cab offers an entirely new context in more ways than one. 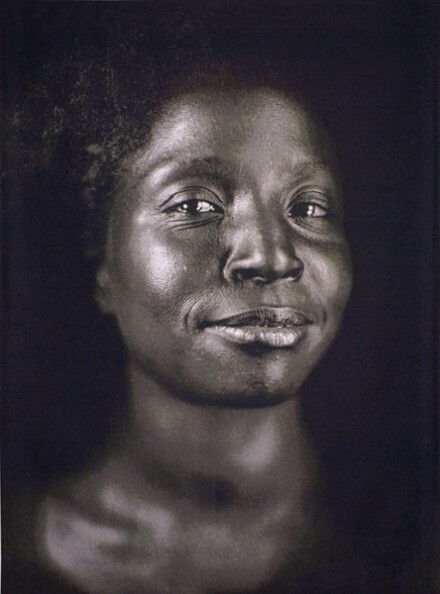 In dealing with this consideration, Wiley’s work has simply been scaled down, allowing for his racially and politically charged juxtapositions to still be taken in as a whole. The Virgin Martyr St. Cecilia (2008) and Femme Piquee Par Un Serpent (2008) are Wiley’s two pieces selected for the project. Close has chosen instead to crop small portions of his work for the cabs, decontexualizing Lucas Samaras’ mustache or Lorna Simpson’s eyes to an even further extent (Lucas (1987-88) and Lorna (2006) are Close’s two contributions). A recent appointee to President Obama’s Committee on the Arts and the Humanities, Close is an advocate of exploring new avenues for public art education and promotion. Today, the search is on for that unusual tree to add whimsy and creativity to holiday decor all over the house – and you never know where it will turn up. Customers aren’t sure what to think when they first see Mary Harding and Edie Teubner’s Christmas tree hanging from the ceiling. This is the second year they’ve displayed the inverted tree in the window of their St. Joseph gift and gourmet food store “In Good Taste.” Last year there was a comment or two questioning their taste, and one questioning their motives. But this year, the inverted greenery has brought lots of smiles and plenty of talk. “It’s just a fun thing,” Mrs. Teubner says, “There’s no hidden meaning. And if you have dangling ornaments, it shows them off so much better.” The upside-down Christmas tree has been around for several years, but it wasn’t until last year that sales really took off in the United States, says Bill Quinn, owner of the online Christmas tree store christmastreeforme.com. “They want something unique, something different.” He recalls a customer who bought a 9-foot white upside-down tree. She wanted it in time for a large party she was having. “She wanted a unique discussion point. If the guests didn’t have anything else in common to talk about, they could talk about – and gossip about – the white upside-down Christmas tree.” BASIC BLACK Mr. Quinn was interviewed about the upside-down trees last year by reporters while in the United Kingdom. That’s when he discovered one of this year’s unusual, and top selling, trees: the black Christmas tree. Reporters wanted to know all about it, he explains, because it had just become a big hit in Europe. Mr. Quinn didn’t have a clue what they were talking about. “I told them, ‘that’s Halloween. We don’t do black over here. '” But within months, he started getting requests and has already sold out of them this year. And they are not being bought for a gothic look or anti-Christmas expression. “The word we’re hearing (for the black tree),” Mr. Quinn says, “is elegant – putting silver, gold and crystals on it.” PINK, FEATHERS and TINSEL You won’t find black trees at Michael’s in St. Joseph, but they are selling plenty of pink. “We sold out of the pink feather trees already,” says store manager, Bill Helm. “I was astounded how well they sold.” He doesn’t know if people are buying them for themed rooms or for a breast cancer awareness campaign, but the pink tinsel trees are also big sellers, he says. Pink in regular needles also has been very hot this year, agrees Mr. Quinn. But the tinsel trees are what has taken him by surprise. They are similar to the World War II-era aluminum trees that used a revolving color wheel for color. “This is the ultimate gadget tree,” he says. It’s basically a spiral tree that circles around a clear acrylic tube, instead of a metal center pole. You fill the tube with water (about 5 gallons for the 8-foot model). Turn it on and LED lights going from red to green to blue to clear reflect off the bubbles as they swirl to the top. The effect is something like a lava lamp, he says. The Quinns have an 8-foot version in their living room, decorated with a few fish ornaments. His 4- and 6-year-old daughters absolutely love it, he says. Although it’s hardly the plain green variety he grew up with, it’s been just as enjoyable. 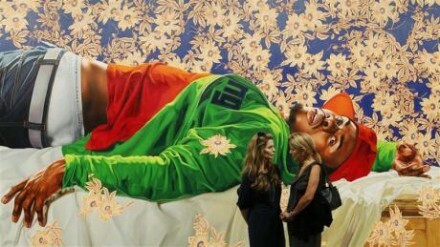 This entry was posted on Monday, January 10th, 2011 at 12:00 am	and is filed under Art News. You can follow any responses to this entry through the RSS 2.0 feed. You can leave a response, or trackback from your own site.